Which? has found that all 10 of the big high-street banks offer customers significantly lower rates for all types of savings accounts, with the best savings rates coming from challenger banks. This comes after TSB recently increased the rate on its two-year fixed-rate bond to 1.25%, up from a paltry 0.8%. While the bank says that it’s providing the ‘leading rate on the high street’ for this term, it still significantly lags behind the top non-high street rate of 2.35%. We’ve looked into how the other big high street banks – TSB, HSBC, NatWest, Royal Bank of Scotland, Halifax, Lloyds Bank, Santander, Nationwide, Barclays and Bank of Scotland – compare. Below, we reveal where you can find the best savings rates, and name and shame the high street banks that are short-changing savers. The table below shows the five best-rate accounts available nationwide. The links will take you through to our comparison site, Which? Money Compare. West Brom Building Society Direct Double Access 1.5% £1,000 minimum initial deposit. Two withdrawals allowed per account year – any more will mean AER drops to 0.25%. Virgin Money Double Take E-Saver 1.5% £1 minimum initial deposit. Two withdrawals allowed per year. Closure counts as a withdrawal. Marcus by Goldman Sachs Online Savings Account 1.5% £1 minimum initial deposit. AER drops to 1.35% after 12 months. Post Office Online Saver 1.45% £1 minimum initial deposit. AER drops to 0.25% after 12 months. RCI Bank Freedom Savings Account 1.42% £100 minimum initial deposit. Source: Which? Money Compare. Correct 13 December 2018. There are no big high street banks to be seen. Instead, all of the top rates come from challenger and mobile banks. While the newer banks were once seen as outsiders among trusted bricks-and-mortar high street mainstays, the tables seem to be turning – proved by the fact that challenger bank Monzo recently topped our best bank customer survey, and that ‘high-street’ banks are quickly disappearing from the high street. So what rates are the high street banks offering their customers? The table below shows the highest-rate instant-access accounts from the big 10 high street banks. These are the top rates that don’t require an additional premium account to be held, or for customers to have held an account for a certain period of time. Nationwide Limited Access Saver 0.75% £1 minimum initial deposit. Five withdrawals per account year allowed; further withdrawals will cause interest to fall to 0.1% for the remainder of the year. TSB eSavings 0.55% £1 minimum initial deposit. AER falls to 0.25% after 12 months. Santander eSaver 0.4% £1 minimum initial deposit. HSBC online bonus saver 0.35% £1 minimum initial deposit. AER drops to 0.1% in any calendar month you make a withdrawal or close your account. Barclays Everyday Saver 0.25% £1 minimum initial deposit. Bank of Scotland Access Saver 0.2% £1 minimum initial deposit. Halifax Everyday Saver 0.2% £1 minimum initial deposit. NatWest Instant Saver Account 0.2% £1 minimum initial deposit. Must have a NatWest current account. RBS Instant Saver Account 0.2% £1 minimum initial deposit. Must have a Royal Bank of Scotland personal current account. Lloyds Bank Easy Saver 0.2% £1 minimum initial deposit. Nationwide’s Limited Access Saver offers the top rate here, but it’s still only half the AER of the top rate offered by challenger banks. While all of the high-street banks are accessible to those with smaller savings pots – none require more than £1 as a minimum initial deposit – there are still tricky caveats to be aware of, such as AERs that dramatically reduce after 12 months, and accounts that only permit a certain number of deposits. These terms may be worth putting up with to get a competitive rate, but it hardly seems worth it when your savings are earning so little. Looking at what difference this can make to your money, someone who saves £1,000 for a year with one of the five banks offering a frankly terrible 0.2% AER would earn just £2 after a year, compared to a potential £15 with one of the top-rate accounts paying 1.5%. 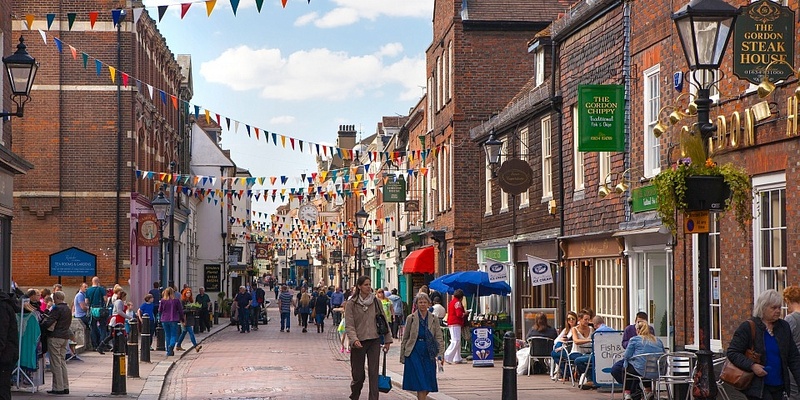 Saving with a high street bank could also mean you lose out with fixed-rate savings accounts. The table below shows the top rates for one to five-year fixed-rate accounts. *Expected Profit Rate. Source: Which? Money Compare. Correct 13 December 2018. Again, none of the big 10 high street banks feature. While there is the issue that at least two of these accounts would be out of reach for a lot of savers – as a high minimum initial deposit is required – the table still demonstrates how wide the gap has become between challenger and high street banks when compared with the table below. This table shows the top rate offered by any of the high street banks for the same fixed terms. No high street banks offer four-year fixed-term accounts. Again, every rate here lags behind the top rates, to the point where locking your money away in a one or two-year fixed-rate bond with a high street bank will mean you’re losing out on at least 1.1% of interest. Repeating the example of someone saving £1,000 for 12 months, NatWest’s one-year savings account would pay £10.05, whereas Gatehouse Bank’s account would pay £21 – more than double. And the accounts in the table above are at the top end; many of the high street banks offer much lower rates. For one and two-year fixed-rate accounts, Santander trails at the bottom of the pack with its accounts paying 0.5% and 0.55% AER respectively. Both require a minimum initial deposit of £500, and can be easily beaten by many instant-access accounts, so customers are losing out on both rates and convenience. In addition to the poor rates, there is also less choice from the high street banks. None offer four-year fixed accounts, only three have three-year accounts and Nationwide has the only five-year account. No fixed-rate accounts come close to beating the current rate of inflation, so the money you save will actually lose value while it’s locked away. Whether customers are choosing to save with high street banks to be loyal, because they trust the name, or because they’re unaware of better offers out there – it’s clear they’re massively losing out. Should I get a challenger bank savings account? While, strictly speaking, challenger banks are any that ‘challenge’ Barclays, HSBC, Lloyds Banking Group and RBS – which would mean TSB is technically a challenger bank – nowadays the term tends to refer to smaller companies offering mobile-only, branchless banking. There are pros and cons to saving with such companies. As the tables above have shown, they can offer higher rates, along with low fees and state-of-the-art apps. However, if doing all of your banking via your mobile isn’t an option for you – because you don’t want to, or you don’t have a phone – you won’t be able to access these banks. There’s also the issue of what to do when something goes wrong: there are no branches, so it’s difficult to speak to an actual person. Instead you might have to make do with talking to a chatbot or via a messenger service. These are all factors you should bear in mind before deciding where to put your savings. You can browse hundreds of savings accounts with Which? Money Compare to find the best one for you.